Construction errors stem from the design - how much should we care? In a major construction project, we looked at the impact of ignoring seemingly minor errors in BIM design at the planning stage. Many contractors we work with suggest that getting BIM design right at such a detailed level is unimportant on the overall project. We set out to prove that certain errors in a BIM model can lead to major problems. By getting it right from the start, you can increase the likelihood of achieving your project on time and on budget. The BIM model we chose to examine is one we come across frequently at Kreo: large-scale type A1 (retail) buildings. We took just one section of the model and chose one specific type of error to fix: the analytical model. In the original model, we found 1,720 analytical model errors. Kreo’s machine learning was able to fix around 75% of the errors automatically, bringing the number of errors down to 385. The analytical model is a structural requirement. When Kreo's AI did the error checking, it also identified errors that were less crucial to fix. These did not affect the future building's constructability. The errors we discuss in this blog are categorised under the analytical model and are crucial to the future building of the project. Where two physical elements connect, the analytical representation of the element must have a common node. You can see in the diagram above, the construction error is where the beams connect. If there is no connection between the beams, they will not hold up the building. This kind of connection is repeated throughout the entire building so the construction error would be multiplied several times. For quantity takeoff, we compared the masses of the metal structure and concrete in the two versions. The cost difference between quantity takeoff of the original vs the fixed version was minimal (around 1.9%). When looking at resources, however, there was a different story. We looked at the impact that these errors would have on the cost and schedule before and after fixing the errors. When we looked at cost, the direct cost was around the same before and after the error fix. However, the project duration increased from 245 to 290 days. That’s an increase of 15.5% in the project duration that would not have been accounted for. In a 4D BIM simulation, you can instantly see why a seemingly minor set of errors would cause chaos if left in the plan. The cost and schedule are not the only metrics to be affected. There's also the construction sequence, which is demonstrated in the comparison images above - the model before and after being fixed. When you realise it would be physically impossible to build your model, it becomes harder to say the errors can be ignored. Why is it so hard to find and fix pre-construction errors? Most AEC professionals will read this and agree that it would be ideal to get the pre-construction cost and budget right from the start. Most AEC professionals know how to find and fix these errors. So what stops them? Usually, it’s time. Companies have so little time to bid on projects. According to our research, around 4 weeks is a normal amount of time given to complete a bid. With the practices and technology we use today, companies will struggle to put together an accurate bid under these time constraints. Firstly, there’s the lack of understanding about how to use BIM. Secondly, there’s a shocking lack of collaboration in the AEC industry. Finally, the software designed to speed up people’s jobs only helps one or two of the groups involved in the bid. Even then, it doesn’t go far enough to help make their work accurate at speed. The other factor stopping companies getting this right is money. When companies bid on for a project, they often have to bid low to win the project, even if that means ignoring the details. Clients are also prone to overlooking bids that might be more accurate in favour of the lower bid. This race to the bottom only works for so long, as we saw in the infamous case of Carillion this time last year. We at Kreo believe that the pre-construction phase of the construction project is key to getting projects to run on time and on budget. Maybe companies won’t reap the rewards of successful pre-construction planning until years later, especially on mega-projects. However, no company would admit short-term thinking. CEOs need to start taking pre-construction more seriously. They must give their employees all the tools, education and time needed to achieve better results. If AEC professionals are working flat out just to get a basic bid together, they need to start working smarter – not harder. Kreo is an artificial intelligence solution that will transform the industry’s culture of ignoring the details. Humans usually hate detail, preferring to be creative and thinking of the bigger picture. Machines were created to carry out the mundane work for humans – so let’s use them! 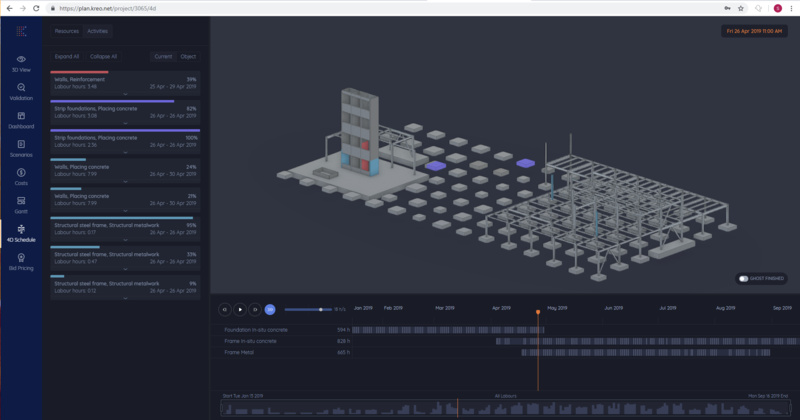 By using artificial intelligence, you can make your pre-construction BIM model accurate, leading to realistic project predictions. If companies used this technology to speed up their pre-construction planning, they would be able to bid on more projects. Ultimately, they would be able to evaluate whether a project was realistic before even bothering to bid on it. Clients also need to stop the bad practice of suggesting unrealistic costs in the first place. 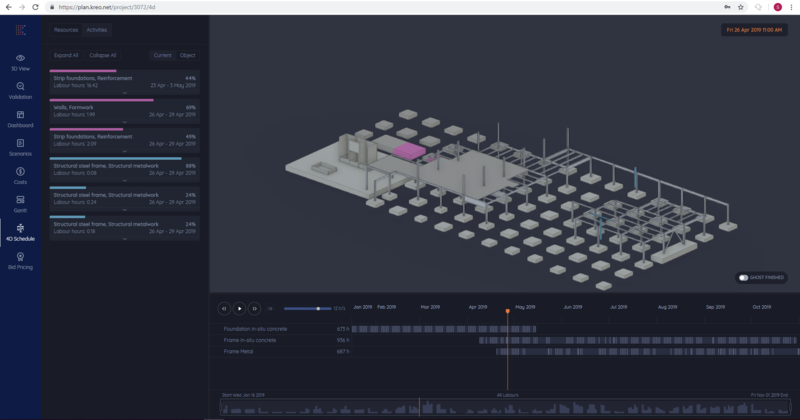 Kreo offers an AI solution to help clients get a better understanding of what a building would look like from the start. This will allow them to go to an architect with a realistic suggestion. That would in turn take the pressure off the architect, who often create designs to fit the unrealistic cost. With a realistic starting point, the entire project will be set up for success. The entire time needed to run quantity takeoff and resource levelling estimates on this project took less time than it took to write this blog post. Technology is finally ready to increase AEC professionals' productivity. It will make pre-construction errors a thing of the past. Ready to transform the industry? Request a demonstration of Kreo today and see how much better your BIM models could be.